You know this thing about Harry and Bunnie Games? Harry and Bunnie Games is the latest Disney Channel Games category that we have created on our website, the only place where you can currently find online games based on this great show. All the Harry and Bunnie Games are worth giving a try, so start playing them right now, and you will see for yourself just how fun they all are! In Harry and Bunnie Games you can find 2 games that we've published for these kids and childrens that are interested to play Harry and Bunnie Games, this game gategory have been created on 12.09.2016. These games with Harry and Bunnie Games have been voted 1 times and the avarage of vote is 5.00 stars. We advice you to play the last flash game from Harry and Bunnie Games, Harry and Bunnie 5 Differences that have been published on 24.09.2016 11:09. Harry and Bunnie 5 Differences its a part of Harry and Bunnie Games category and until now its played 6737 times. Try it now on Cute-Games.com! If your like the Harry and Bunnie 5 Differences game you can write a comment in the game page. Recommend this game to your friends if you like it! 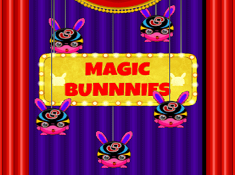 Magic Bunnies its a part of Harry and Bunnie Games category and until now its played 1304 times. Try it now on Cute-Games.com! If your like the Magic Bunnies game you can write a comment in the game page. Recommend this game to your friends if you like it! Find More About Harry and Bunnie Games! On www.cute-games.com you now have the chance to play Harry and Bunnie Games, which is the latest category of Disney Channel Games that we have added on our website, and which we are sure that many of you are going to find very interesting. The first interesting thing that you need to know about the series is that it is based on a Disney Channel show called Harry and Bunnie, and while that is not really unusual, the fun fact is that this show is currently not airing on Disney Channel in the United States, but only on Disney Channels in Asia. Disney Channels always tries to curate the content and personalize it for each specific country that it is airing in, so it’s no wonder that with a continent as big as Asia, there are original shows produced and aired there. Still, since Harry and Bunnie is a show which can easily translate for western audiences, we are sure that very soon we are going to see the show aired in many other countries at all. We wanted to be prepared for that moment, and we also wanted to please all the asian fans of the show and offer them Harry and Bunnie Games, since they could not have found games like these before, and we are sure that there are many children who watch it and would have wanted to played games based on it. As you now, our website always tries to be the first to offer new games, and have as many diverse categories as possible, so it’s no wonder at all that it is here that you can find and play Harry and Bunnie Games for free, all the time, from whatever part of the world you come from! So, while some of you who are reading this description have watched the show and probably know all about it’s plot, it’s characters, and other fun facts, those of you who have not yet seen it, might have doubts whether you want to play Harry and Bunnie Games, or if they are worth it or not. First of all, all games on our website are worth playing, and because we want you to feel confidend to play the games and have no difficulties doing so, this description was created in order to offer you all the information needed on this show, information which we are going to give to you right now, so make sure you read the following lines int he description, if you are curious. Harry is a wannabe magician, and Bunnie is his stage rabbit. While the two have a close relationship, they find themselves at odds in each episode, as each episode shows Harry making a plan and putting it in action, a plat to get back his magic wand that Bunnie stole from him. On the other side, Bunnie uses the magic want to sabotage Harry’s plans. Unfortunately for Harry, his plans never succeed, and Penny, the principal of the magic school punishes Harry for Bunnie’s wrongdoings, as she naturally asumes that Harry is at fault. Harry wants to be a magician, even though he is not that good at it, is a little nerdy, and care a lot about his hairstyle, which he always wants to be on point. Bunnie is a bunny used as a prop for Harry’s magic shows, but this mischievous little rabbit is a lot smarter that it seems at first sight, steals Harry’s wand out of spite, and interestingly enough, is a lot better and magic than Harry, who is supposed to be the magician of the duo. As you can clearly see from the description that you have just read, the show is a lot of fun, has really interesting and funny characters, and there is never one dull moment in each episode. That should only make you want to play Harry and Bunnie Games on our website even more, as this way you can interact directly with the characters, and have a really great time playing the Harry and Bunnie Games. So far, since the show is new and only airs in Asia, we can’t really say what kind of games you will be able to find in this category, but as per usual, we are sure that you will find puzzle games, memory games, differences games, or coloring games, and a lot of other interesting formats like these ones. What you need to do is to continue to visit our website as often as possible, to be able to be the first one to find and play the new Harry and Bunnie Games that we are going to offer, and all the other really fun games on our website! We are sure that you will have a lot of fun on this page and on all our others, so start playing games on our website right now!